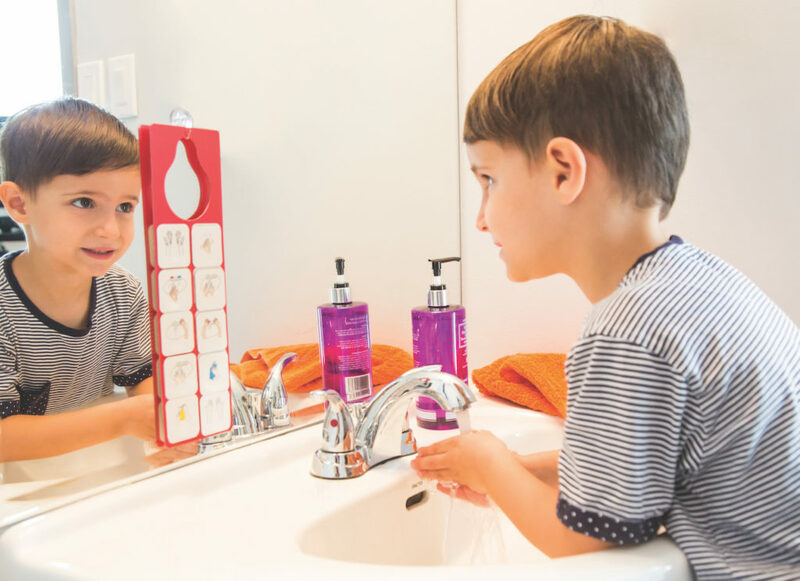 Learning to brush my teeth is a convenient magnetic tool to help children brush their teeth. Easy to use, children will easily learn every step enabling them to go through the routine by themselves and become autonomous. This kit includes 10 magnetic picto-grams depicting all the important steps to assist children through the sequence of brushing their teeth. Ref.nr. R4003—Brush your teeth available in Dutch, English and German language. NOW available. Learning to wash my hands is a convenient magnetic tool to help children wash their hands. Easy to use, children will easily learn every step enabling them to go through the routine by themselves and become autonomous. This kit includes 10 magnetic pictograms depicting all the important steps to assist children through the sequence of washing their hands. Ref.nr. R4004—Wash your hands available in Dutch, English and German language. NOW available.